One of the most noteworthy historical sites in Keweenaw County is Central, or Central Mine. The photo above shows three buildings that are open daily for visitors. From left to right are House #25, The Central Visitor Center, and House #61. Central is a village that once was the home for over 1,200 people, and the site of one Keweenaw’s most successful mines. The mine, opened in 1854, produced nearly 52 million pounds of copper by the time it closed in 1898. Several miners’ homes and buildings still stand on the site. In 1996, the Keweenaw County Historical Society acquired 38 acres of the old Central site. 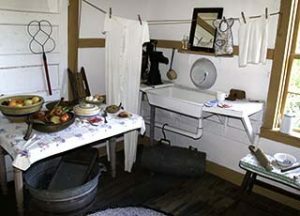 Some of the residences are being restored, and a Visitors Center provides interpretive exhibits not only about the mine but also about the miners’ families, homes, schools and churches. The KCHS has been restoring the buildings at Central. In 2017 they began renting House #8, an old miners house, for weekly rentals to raise income to continue this restoration process. Please see the Rental Tab on the menu above for rental information as well as a slideshow of the inside of the house. It looks like laundry day in the kitchen of House #25. Two hiking trails opened in 2005, a fun way to see the various sites in Central. The trails are 1/4 mile and 1/2 mile long through the woods. They provide views of several house foundations, a glimpse at the site of the school house, as well as a magnificent view of the valley from the top of the upper rock pile. Descendants of Central mining families gather each year, on the last Sunday in July, at the old Methodist Episcopal Church for the Central Reunion. The church, erected in 1868, with its distinctive battlemented tower reflecting the Cornish ancestry of many Central families, closed in 1903. It is reopened on each Reunion Sunday for a service of tribute to the hardy pioneers of all faiths from all the early copper mines that dotted Keweenaw County. July 30, 2017 will mark the 111th anniversary of these reunions. Please feel free to come and visit. Visit the Central Mine Methodist Church web site for information on the Reunion and church history. The Memorial Garden at Central. 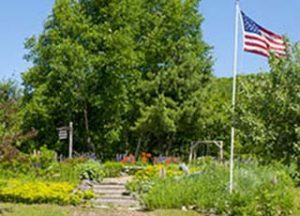 One of the most memorable and peaceful parts of your visit to Central Mine should be a walk in The Central Memorial Garden located directly across the street from the visitor’s Center. Click here for additional photos and information about the garden. While the Central Mine site is open year-round the Visitors Center is open from mid-June through early October. Please respect the privacy of dwelling occupants when touring the mine site. 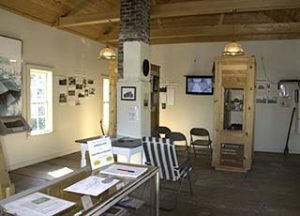 Hours & Admission – The Central Mine Visitor’s Center and display homes are open from mid-June to early October. There is no admission fee for this museum however a donation is appreciated. Related Links – You may wish to explore the following sites for additional information about Central Mine.